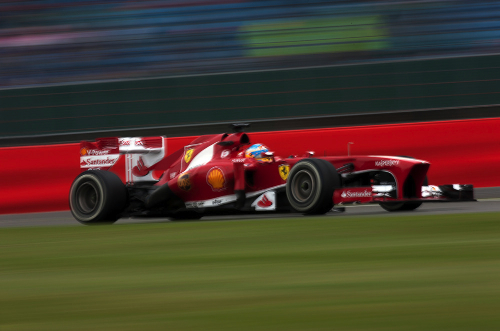 Fernando Alonso has expressed alarm at the situation at Ferrari after qualifying just tenth at Silverstone. The Spaniard is already 36 points behind championship leader Sebastian Vettel, who qualified third behind the dominant Mercedes cars on Saturday. "It's a bit of a surprise," said Red Bull's Vettel. "They've been very competitive here the last couple of years." Alonso initially pointed the finger at Pirelli, as he was quoted by Brazil's Totalrace as suggesting the compounds "are not appropriate for F1". He also told German broadcaster Sky: "We know the hardest tyres favour one team, and we know they are not ideal for us and Lotus. "But the fact is that others are working better than us." He therefore admitted Ferrari's flaws. "We have to improve," he said. "We started the year with two cars on the front row and now we're getting into dangerous territory, struggling to get into Q3. "We have not developed well enough in the past two months; the new parts have not been what we had hoped for," Alonso is quoted by international reports. He also insisted no one should expect Mercedes, so dominant so far at Silverstone, to run away with victory on Sunday. "It is quite easy to make a car that goes well in qualifying, and more difficult to make it right for the race," said Alonso. Asked if Mercedes has taken strides forward because of its secret Pirelli tyre test, Alonso is quoted by Spain's AS newspaper: "I think they are doing a better job than us; no more to say."